New Delhi, March 20: There seems to be no stop to the problems of Kolkata Knight Riders (KKR) as they face another blow. 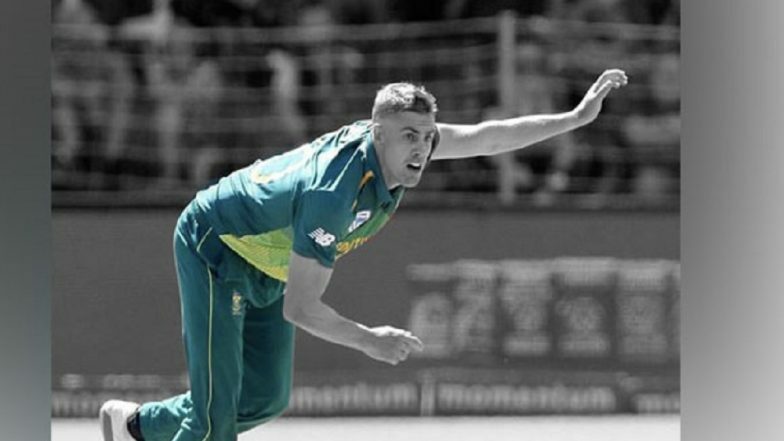 with bowler Anrich Nortje being been ruled out from this edition of Indian Premier League (IPL) due to a shoulder injury. The Proteas pacer took Twitter to inform this, the tweet read, "Unfortunately due to a shoulder injury I've had to pull out of the @IPL. I wish @KKRiders all the best and bring the trophy back home!! #KKRHaiTaiyaar." Earlier, KKR lost Indian duo Kamlesh Nagarkoti and Shivam Mavi because of injury. The team brought in fast bowler Sandeep Warrier and wrist spinner KC Cariappa as their replacement. But now the Shahrukh Khan co-owned team will have to find another replacement for Nortje. VIVO IPL 2019: SRK Unveils ‘KKR Hai Taiyaar’ Song Video With a Message for Fans ‘You Pray for Us, We Play for You’. The right-arm pacer made his ODI debut against Sri Lanka, earlier this month and there also he did not disappoint as he took similar amount of wickets in four matches. The much-awaited IPL is set to kick-off on March 23, however, KKR will start the tournament on March 24 against Sunrises Hyderabad at Eden Gardens.